Nicholas Tarlov, M.D., CMHS Interventional Stroke Neurologist, will present a lecture on “Is My Patient Having a Stroke?”. He will 1) Discuss utilization of recommended stroke-evaluation time benchmarks to stabilize patients within 60 minutes of arrival in the emergency department, including initial evaluation, assessment, imaging, and laboratory studies., 2) Outline current treatments for acute ischemic stroke, including IV thrombolytic therapy with tissue-type plasminogen activator and endovascular therapies, such as intra-arterial thrombolytic therapy and the use of clot-retrieval devices, and 3) Discuss how to utilize tools to predict patients’ clinical response and risk of hemorrhagic complications following IV thrombolytic therapy. 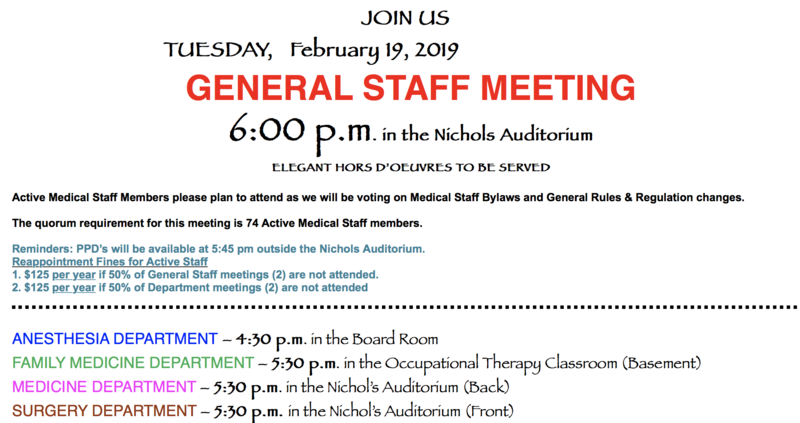 The conference will take place on Tuesday, February 19, 2019, at noon, in Nichols Auditorium. Lunch will be provided and Category 1 & 1-A CME will be available. If you would like to view this lecture online, please contact the CME Coordinator, Christeva Vazquez at cvazquez1@cmhshealth.org or 805-948-5638 to be added to the webinar list. Print, save as a PDF or bookmark the following link as a valuable reference. Dr. Goodfriend and I were discussing how often Medical Staff is unsure of who to call or hesitant to ask about issues that may be confusing or unclear. One oft-heard reason is that colleagues don’t want to bother us. Dr. Goodfriend’s general knowledge and expertise are in the realm of appropriate chart documentation and compliance. As your CMO, I will assist or point you in the correct direction with most everything else. Part of our job descriptions is to be a resource for the Medical Staff. 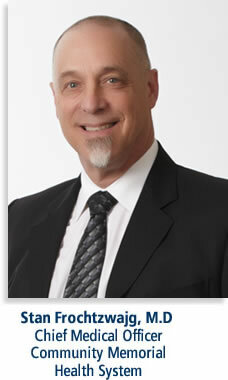 Dr. Goodfriend can be reached through his cell phone: 805 701-3514. I can be reached through the Medical Staff Office at 805 948-5418 or directly at 805 701-1466. Allscripts PM and EHR – 3-hour downtime starting 2/19 at 10:00 PM. Patient Keeper and Intelex – 3-hour downtime starting 2/20 at 1:00 AM. The IRS saw an approximate 450% surge in phishing and malware incidents during the 2017 tax season. CMHS has already started to experience an uptick in email’s requesting W-2’s and other documents preferred for identity theft. Example: This email originated from outside the organization. Please verify the sender and proceed with caution, Do not click any links, open any attachments, or reply unless you are certain of the sender. Remember: Scam emails are designed to trick taxpayers into thinking these are official communications from the IRS or others in the tax industry, including tax software companies. These phishing schemes can ask taxpayers about a wide range of topics. Emails can seek information related to tax refunds, filing status, confirming personal information, ordering transcripts, verifying PIN information and asking people to verify their tax software account. Variations of these scams can be seen via text messages, and misleading communications can be seen in every section of the country. Keep in mind that the IRS will never contact you by telephone if there are issues with your returns, or if they need information. They will always send information by U.S. mail, and only by email if you have requested and provided them with an address. Do not respond to any contact that is threatening or attempts to alarm you. Always contact the IRS through their official website (www.irs.gov) or call for telephone assistance. UnitedHealthcare (UHC) is changing how it handles claims for evaluation and management (E/M) services when the medical record documentation does not support the E/M level submitted. Currently, UHC denies such claims, in which case the physician must either appeal, resubmit the claim with the appropriate level of service, or amend the documentation to support the level of service billed.Under a policy change effective in the second quarter of 2019 (www.uhcprovider.com), UHC will no longer automatically deny a claim based on the documentation but instead may adjust the level of a submitted code to reflect what it believes is appropriate and then pay it. The policy appears aimed at Level 4 and 5 services. If a physician disagrees with the adjustment, he or she could still appeal as that process will not change. Your billing staff will need to be on their game and know what the appropriate payment is for the E/M codes they submit to catch potential downcoding by UHC. Close review of remittance advice may be in order. Otherwise, your practice risks being underpaid and not knowing it.